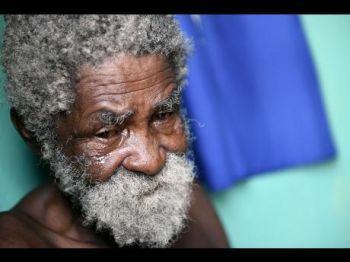 There will be no Independence celebrations for residents of 68 and 70 Bond Street in Denham Town, west Kingston, today. They will instead spend the day trying to make preparations to move on with their lives after fire ravaged their houses yesterday morning. "We will not be independent. Instead, we will be dependent as we will have to depend on persons to put us up. We will have to depend on people to give us a bed and depend on people to help wi get back a start in life," quipped one young man as he picked through the rubble of what was once his house. All he found was a photo album with the edges singed but most of the pictures intact. "A sleep mi a sleep an' di heat wake mi up. Mi kick off mi door an' come out a look weh di fire a come from. By di time mi si seh a inna mi yard an' mi run go back in, the heat just push mi out. All mi a throw water pon it, di fire jus a get bigger," said Delano, who was one of 13 adults who lost everything in the fire. "Mi work hard an' a start in life, and mi buy everything ... bed, TV, and tings. Now mi lose everything an' have to start over," added Delano. It was a similar story for Kasia Williams. But her troubles were compounded as she had already bought some of the back-to-school supplies for two of the five children she mothers. "Mi a sleep an' mi hear, 'Unnu a go mek di fire bun mi up?' 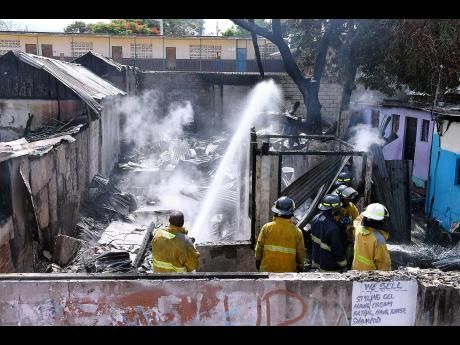 and when mi run out, mi si di fire a come, suh mi jus throw over di baby dem ova di fence an' mi jump ova," said Williams as she recounted to The Gleaner how she managed to save the lives of the children. She said that last Saturday, she bought about eight books for her youngest child and could do nothing to save them as the flames destroyed the house she lived in with her two children and her three stepchildren. The fire service is yet to determine the cause of the blaze, which started shortly after 8 a.m. and left 13 adults and seven children homeless. The loss is estimated at $4.5 million.